Ollivanders is known to be one of the finest wand shops in all of Europe. The main shop is located at Diagon Alley.This is the right place from where you can get your wand ,but don’t forget that nothing is for free .You will have to earn enough Galleons in order to buy one of this wands .Since we don’t want our wand shop to become boring we are going to change the list from time to time with new wands . So just check this thread as many times as possible as you never know what you will see. 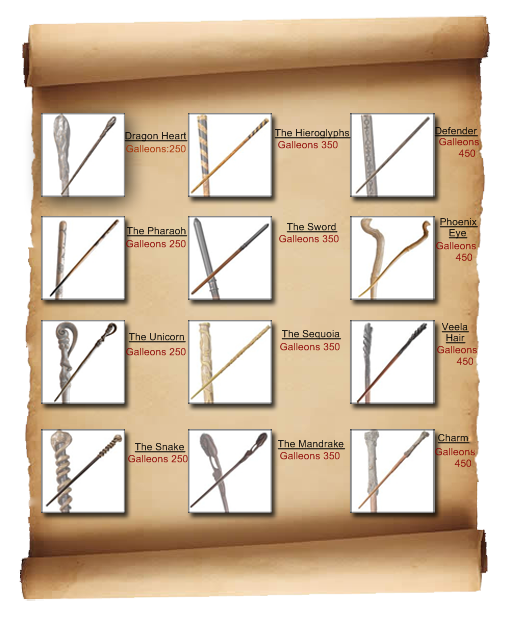 In this topic you will find only the list of the available wands .In order to buy one you will have to take a look at “Buying a Wand” Thread. There you have all the information about how to get one in your trunk.